Wow, that was a pretty incredible two weeks. I have to give credit to all the blue jacketed volunteers who covered the city with huge enthusiasm for their often thanked but little rewarded task - and I should also give thanks to the weather :) - even if it didn't cooperate beforehand with the warmest January on record leading up to the games, a full week of sunshine is rare February treat in Vancouver and certainly helped turn the mood around after a rough first couple of days - and the skies even cleared again for the last day of competition and the closing ceremonies here on Sunday. For posterity (because my memory is going), here are a few of the highlights for me, from the Olympics. * After 6 hours of wind, fog and rain that alternated between pounding and blowing, seeing Jasey-Jay Anderson, 4 time Olympian, win gold with a come from behind victory against Austrian Benjamin Karl. I stood, along with the rest of the crowd, for the final run down the hill, but crouched a little so as not to block the view of the woman with the small child who was behind us in the stands. Only after Anderson's win, when the media came up into the stands did we realize that the woman was Anderson's wife and the child his young daughter. Anderson actually had a real struggle with his first qualifying run down the hill, and needed a good time on his second run to even make the knockout stage. But he flew down the hill on the second run and qualified 10th (out of 16 that made the knockout round). Then in the semis he almost went down but somehow kept his balance well enough to still win the race. Having seen the conditions at Cyrpess for myself, I have to say it was a true miracle of planning and effort that all the events at Cypress went off as scheduled. * The men's short track relay team, changing their tactics at the last minute to do their relay transfer from the opposite side of the ice from the rest of the teams for the last few exchanges. While the Koreans, Chinese and Americans slowed each other down in the last few exchanges on the congested track, the Canadians opened up a lead that nobody could make up. In a straight skating competition I bet the Koreans beat the Canadians every time, but with better teamwork and strategy, the Canadians took gold. * Then the next day, the men's long track relay team win gold. On the final corner, Mathieu Giroux, originally a short track skater, brings some innovation to long-track from the world of short-track. In the long track pursuit event, three teammates skate and the time is set by the last one to cross the line. On the final corner Giroux put his hand on the back of teammate Lucas Makowsky and helped push him around the corner. After the Canadians won the gold by .21 seconds, the teammates agreed that this innovation brought over from short track (where teammates pushing each other as they make the relay exchange is a key element) made the difference in winning gold. * On the topic of the long track pursuit, in the semi-final on the women's side between Germany and the U.S. - with the Germans looked to be heading to victory. But then on the final corner the veteran Anna Friesinger-Postma lost her balance and almost fell over. Friesinger fell back so much that her teammates basically came to a stop at the line waiting for her. Almost unable to skate at all on the final straightaway, Friesinger threw herself over the line on her stomach, pounding her fist on the ice in despair, believing she had cost her teammates a chance to skate for gold - and then she looked up a few seconds later and smiled in shock as she realized that despite her near collapse at the end, she still crossed the line a couple of tenths of a second ahead of the last American skater. * Earlier in the Olympics, at a time when the Canadian team was struggling a little, Jon Montgomery, a man with nerves of steel, or maybe no nerves at all, comes from behind on the final run to win the men's skeleton event, and leads a celebratory walk through Whistler village, grabbing and chugging a pitcher of beer along the way, becoming an instant legend. * Peter Northug, with the weight of a country's expectations on his back, makes up a ton of time against some of the best skiers in the world, to bring Norway from 4th to 2nd for a silver medal in the men's cross country relay, and then caps things off with a gold medal sprint to the finish in the 50k marathon. * While I'm on the topic of cross country, the men's team from Canada didn't win any medals but they put up a ton of best ever finishes for this country in men's cross country, with, if I counted right, 7 top ten finishes including a 4th and two 5ths. Canada's previous best finish in the 50k, for example, was 44th, but Devon Kershaw came 5th this time around, under 2 seconds behind the leader, and all 4 Canadian entrants came in the top 35. * The raucous curling crowd serenading Kevin Martin and crew with O Canada near the end of the 10th end of the final, as the Norwegian skip Thomas Ulsrud, remarkably gracious in defeat, looked on and shared a laugh with Kevin Martin, telling him it must be such a great feeling to be able to curl in front of such an amazing home crowd. Also, Martin's almost perfect freeze in the 7th end, the shot of the match that allowed him to take a pair and carry his lead home from there. * The Slovakian men's hockey team. They beat the Russians, they beat the Swedes, they damn near put the tying goal in on Canada with seconds to go, and they were quite unfortunate not to take the Bronze from Finland. The whole team played with a ton of heart and won a lot of respect from the hockey fans in Vancouver. * So many other great performances, I'd be here all day trying to list them, Bilodeau and Heil performing so well under incredible pressure, our women's bobsled team going 1-2, Hamelin winning the men's 500m (short track) and his girlfriend Marianne St. Gelais winning silver in the women's 500m, gold for Christine Nesbitt, two medals for Groves and a final medal for Olympic legend Clara Hughes, Canada setting a (event expansion aided) all time record for gold medals at the Winter Games, Maelle Ricker and Ashleigh McIvor winning gold up at Cypress, the Dutch fans in Richmond, so at home in a land of dykes, beer, and speedskating, great performances by the Americans, winning the most total medals, and the Germans and the Norwegians finishing near the top of the medal table as well, and on down the line. * Joannie Rochette, enough said. * And of course, gold in the men's hockey, although I'm not sure I need to put it on the list for posterity, since I doubt it will ever be forgotten: Luongo making a nice shoulder save after a giveaway by Niedermayer, Niedermayer regrouping to make the outlet pass to Crosby, Crosby flying down the ice and trying to split the defense, winning the race to the corner for the puck and poking it to Iginla, who makes an incredible pass to Crosby who fires home the winner so quickly that the cameraman, the commentators and most importantly, standout American golaie Ryan Miller had no chance to react. * I'm sure I missed a ton of things, and although I did try to see every single event I sadly missed a lot of them, but if I tried to cover every memorable moment, I'd be here all night. Note: This post is the forty-first in a series. Click here for the full listing of the series. "The Theory of the Leisure Class", by Thorstein Veblen, was published in 1899, before the rebirth of the Olympics in the 20th century, but I'd guess that if the Olympics had been around at the time, Veblen would not have been a fan. Veblen is critical of just about everything related to the Guardian syndrome, which he was a keen observer of, choosing to label it based on the 'make rich use of leisure' ethic that is one part of it. The short version of this post is that while Veblen's description of the 'Leisure Class' is almost an exact match for Jacobs' description of the 'Guardian Class', Jacobs saw good reason for the Guardians to be as they were and thought that they were behaving ethically in following their syndrome. Veblen, on the other hand, sees Guardian behaviour as a counter/un-productive anachronism that survives from earlier days but doesn't really contribute much to society. "Any one of the North American hunting tribes may be taken as a convenient illustration. These tribes can scarcely be said to have a defined leisure class. There is a differentiation of function, and there is a distinction between classes on the basis of this difference of function, but the exemption of the superior class from work has not gone far enough to make the designation "leisure class" altogether applicable. The tribes belonging on this economic level have carried the economic differentiation to the point at which a marked distinction is made between the occupations of men and women, and this distinction is of an invidious character. In nearly all these tribes the women are, by prescriptive custom, held to those employments out of which the industrial occupations proper develop at the next advance. The men are exempt from these vulgar employments and are reserved for war, hunting, sports, and devout observances." One difference between Veblen and Jacobs is that where Jacobs sees the difference between the two syndromes as being the difference between 'taking' and 'trading', Veblen sees it as a difference between dealing with inanimate things (gathering berries, manufacturing things, etc.) and dealing with animate things (hunting game, activities that involve dealing with other people, etc.). "Under the guidance of this naive discrimination between the inert and the animate, the activities of the primitive social group tend to fall into two classes, which would in modern phrase be called exploit and industry. Industry is effort that goes to create a new thing, with a new purpose given it by the fashioning hand of its maker out of passive ("brute") material; while exploit, so far as it results in an outcome useful to the agent, is the conversion to his own ends of energies previously directed to some other end by an other agent. We still speak of "brute matter" with something of the barbarian's realisation of a profound significance in the term. The distinction between exploit and drudgery coincides with a difference between the sexes. The sexes differ, not only in stature and muscular force, but perhaps even more decisively in temperament, and this must early have given rise to a corresponding division of labour. The general range of activities that come under the head of exploit falls to the males as being the stouter, more massive, better capable of a sudden and violent strain, and more readily inclined to self assertion, active emulation, and aggression." "The end of acquisition and accumulation is conventionally held to be the consumption of the goods accumulated—whether it is consumption directly by the owner of the goods or by the household attached to him and for this purpose identified with him in theory. This is at least felt to be the economically legitimate end of acquisition, which alone it is incumbent on the theory to take account of. Such consumption may of course be conceived to serve the consumer's physical wants—his physical comfort—or his so-called higher wants—spiritual, aesthetic, intellectual, or what not; the latter class of wants being served indirectly by an expenditure of goods, after the fashion familiar to all economic readers. But it is only when taken in a sense far removed from its naive meaning that consumption of goods can be said to afford the incentive from which accumulation invariably proceeds. The motive that lies at the root of ownership is emulation; and the same motive of emulation continues active in the further development of the institution to which it has given rise and in the development of all those features of the social structure which this institution of ownership touches. The possession of wealth confers honour; it is an invidious distinction. Nothing equally cogent can be said for the consumption of goods, nor for any other conceivable incentive to acquisition, and especially not for any incentive to accumulation of wealth." We see here that Veblen is echoing the distinction between the commercial syndrome which promotes comfort and convenience (consumption values) and the positional externality plagued guardian syndrome where consumption is based on emulation (i.e. keeping up with the Jones). Another difference between Jacobs and Veblen is that Veblen believes that in the modern world where most people are in the commercial sphere of activity, the guardian values of exploit and exerting prowess have come to be associated with commercial activity. "Prowess and exploit may still remain the basis of award of the highest popular esteem, although the possession of wealth has become the basis of common place reputability and of a blameless social standing. The predatory instinct and the consequent approbation of predatory efficiency are deeply ingrained in the habits of thought of those peoples who have passed under the discipline of a protracted predatory culture. According to popular award, the highest honours within human reach may, even yet, be those gained by an unfolding of extraordinary predatory efficiency in war, or by a quasi-predatory efficiency in statecraft; but for the purposes of a commonplace decent standing in the community these means of repute have been replaced by the acquisition and accumulation of goods. In order to stand well in the eyes of the community, it is necessary to come up to a certain, somewhat indefinite, conventional standard of wealth; just as in the earlier predatory stage it is necessary for the barbarian man to come up to the tribe's standard of physical endurance, cunning, and skill at arms. A certain standard of wealth in the one case, and of prowess in the other, is a necessary condition of reputability, and anything in excess of this normal amount is meritorious." This may not be a big difference between Jacobs and Veblen, as Jacobs doesn't say that such behaviour doesn't exist (people going into business for the purpose of gaining status rather than making profits by increasing comfort and convenience) just that it would be unethical, and from Veblen's tone, you get the feeling he regards this type of behaviour as unethical also. On the topic of leisure, Jacobs regarded leisure as a necessary attribute of a guardian society, lest their 'productivity' lead to the depletion of the resources they depended on or endless war against their neighbours. Veblen sees leisure as a demonstration of status, people proving that they are so important they do not need to work for a living. Otherwise Jacobs and Veblen are in agreement on rich use of leisure being a key element of the guardian syndrome. "This conservatism of the wealthy class is so obvious a feature that it has even come to be recognized as a mark of respectability. Since conservatism is a characteristic of the wealthier and therefore more reputable portion of the community, it has acquired a certain honorific or decorative value. It has become prescriptive to such an extent that an adherence to conservative views is comprised as a matter of course in our notions of respectability; and it is imperatively incumbent on all who would lead a blameless life in point of social repute. Conservatism, being an upper-class characteristic, is decorous; and conversely, innovation, being a lower-class phenomenon, is vulgar. The first and most unreflected element in that instinctive revulsion and reprobation with which we turn from all social innovators is this sense of the essential vulgarity of the thing. So that even in cases where one recognizes the substantial merits of the case for which the innovator is spokesman—as may easily happen if the evils which he seeks to remedy are sufficiently remote in point of time or space or personal contact—still one cannot but be sensible of the fact that the innovator is a person with whom it is at least distasteful to be associated, and from whose social contact one must shrink. Innovation is bad form. The revulsion felt by good people at any proposed departure from the accepted methods of life is a familiar fact of everyday experience. It is not unusual to hear those persons who dispense salutary advice and admonition to the community express themselves forcibly upon the far-reaching pernicious effects which the community would suffer from such relatively slight changes as the disestablishment of the Anglican Church, an increased facility of divorce, adoption of female suffrage, prohibition of the manufacture and sale of intoxicating beverages, abolition or restriction of inheritances, etc." Veblen further notes that at the time of his writing, there has been a general shift in society from guardian virtues to commercial ones. "The general decay of the sense of status in modern industrial communities goes some way as evidence in this direction; and the perceptible return to a disapproval of futility in human life, and a disapproval of such activities as serve only the individual gain at the cost of the collectivity or at the cost of other social groups, is evidence to a like effect. There is a perceptible tendency to deprecate the infliction of pain, as well as to discredit all marauding enterprises, even where these expressions of the invidious interest do not tangibly work to the material detriment of the community or of the individual who passes an opinion on them. It may even be said that in the modern industrial communities the average, dispassionate sense of men says that the ideal character is a character which makes for peace, good-will, and economic efficiency, rather than for a life of self-seeking, force, fraud, and mastery." My feeling is that this shift has generally continued since Veblen's day. "As it finds expression in the life of the barbarian, prowess manifests itself in two main directions—force and fraud. In varying degrees these two forms of expression are similarly present in modern warfare, in the pecuniary occupations, and in sports and games. Both lines of aptitudes are cultivated and strengthened by the life of sport as well as by the more serious forms of emulative life. Strategy or cunning is an element invariably present in games, as also in warlike pursuits and in the chase. In all of these employments strategy tends to develop into finesse and chicanery. Chicanery, falsehood, browbeating, hold a well-secured place in the method of procedure of any athletic contest and in games generally. The habitual employment of an umpire, and the minute technical regulations governing the limits and details of permissible fraud and strategic advantage, sufficiently attest the fact that fraudulent practices and attempts to overreach one's opponents are not adventitious features of the game. In the nature of the case habituation to sports should conduce to a fuller development of the aptitude for fraud; and the prevalence in the community of that predatory temperament which inclines men to sports connotes a prevalence of sharp practice and callous disregard of the interests of others, individually and collectively. Resort to fraud, in any guise and under any legitimation of law or custom, is an expression of a narrowly self-regarding habit of mind. It is needless to dwell at any length on the economic value of this feature of the sporting character. The astute man, it may be remarked, is of no economic value to the community—unless it be for the purpose of sharp practice in dealings with other communities." "This non-invidious residue of the religious life—the sense of communion with the environment, or with the generic life process—as well as the impulse of charity or of sociability, act in a pervasive way to shape men's habits of thought for the economic purpose. But the action of all this class of proclivities is somewhat vague, and their effects are difficult to trace in detail. So much seems clear, however, as that the action of this entire class of motives or aptitudes tends in a direction contrary to the underlying principles of the institution of the leisure class as already formulated. The basis of that institution, as well as of the anthropomorphic cults associated with it in the cultural development, is the habit of invidious comparison; and this habit is incongruous with the exercise of the aptitudes now in question. The substantial canons of the leisure-class scheme of life are a conspicuous waste of time and substance and a withdrawal from the industrial process; while the particular aptitudes here in question assert themselves, on the economic side, in a deprecation of waste and of a futile manner of life, and in an impulse to participation in or identification with the life process, whether it be on the economic side or in any other of its phases or aspects." Veblen recognizes that 'dispense largesse' or 'noblesse oblige' is a component of guardian/leisure class life, but insists that this behaviour is somehow contrary to the general spirit of the syndrome. I see that Nate Silver, over at 538 (which I really should add to the blogroll one of these days), is making a mockery of my humble medal tracking efforts. Not content to use one set of predictions, he aggregated several, and not content with a simple chart, he made a fancy table, and not content with tracking predictions for the top countries, he's tracking all the countries. Of course, he's still just going with the flawed old-school medal count, so there's still some work to be done over there, but it's nice to see someone else applying a little bit of quantification to the Olympics as well. Back to the events themselves, kudos to Christine Nesbitt. Having an off day, stumbling out of the blocks and still winning a gold medal is a sure sign of dominance in your field! It's too bad Groves came up just short for the Bronze (in a great skate) or she could have been on pace for a 4 or even 5 medal performance at these games. Here's hoping that she continues her strong skating and takes the 1500m. Finally, should be a fun hockey game against the U.S. on Sunday! Another one of those articles I just like to highlight as an indicator of where we're at these days. "The United Nations says that the world is facing the worst extinction crisis since the dinosaurs were wiped out 65 million years ago, driven by a rising human population and spinoffs such as pollution, expanding cities and global warming." "Apart from food production, less obvious sectors such as tourism, medicines or energy production with biofuels all depended upon nature and diversity of species. "There is an economic opportunity here," said Finn Kateraas, a co-chair who works at the Norwegian Directorate for Nature Management, told Reuters. Protecting species can help safeguard long-term economic growth." I think it says something that the only way people see of preventing humanity from wiping out a huge chunk of the other species we share the planet with is by appealing to our economic (material) self-interest rather than any concern with the survival of other species for their own sake. As a longtime fan of the Olympics, winter version in particular, it sure is fun having them take place in my hometown. Referring back to my earlier post on medal expectations, after 6 days Germany and Canada are pretty much tracking as expected. But the U.S. has had a huge opening few days, racking up 14 medals where they were only expected to be at 10 so far. I said (not on the blog, but trust me) ahead of time that I expected the U.S. to top the medal count, and my reasoning was that they had so much depth in so many events that they had a good chance to capitalize on mistakes by other teams and surprising performances by their athletes. Trust the U.S. to try and own 'our' podium :) Still, watching great athletes like Shaun White, Shani Davis and Lindsey Vonn win their events today, it's hard to begrudge them their success too much. Not to say that the race to top the medal standings is over (don't panic, remember), but the way the U.S. is going, it could be soon. But enough about the U.S. :) I don't imagine I'll ever forget Alexandre Bilodeau flying down the hill to gold in the moguls. And congratulations to Maelle Ricker for a dominating performance in the women's boardercross. I also have to mention the great sportsmanship shown by Kalyna Roberge in the women's 500m short track event. Sitting in third place in her 500m semi-final, with only 2 advancing to the final, she could have taken a chance of making a dangerous pass on teammate Marianne St. Gelais, risking both of them going down - as happened to the Koreans who were 1-2-3 on the final corner of the 1500m final on the men's side, before Ho-Suk Lee tried to pass teammate Si-Bak Sung and crashed them both into the boards allowing the U.S. to claim silver and bronze. But instead of making a dangerous pass, you could see Roberge pull back to avoid crashing into her teammate, and St. Gelais would go on to make the final and claim a silver medal on her 20th birthday. Kudos to her, Roberge, and also Jessica Gregg who came oh so close to a medal finishing in fourth. Note: This post is the fortieth in a series. Click here for the full listing of the series. Well, between the Olympics and being a little under the weather, I decided to postpone the post I had planned and just offer a couple of brief notes on the Guardian syndrome as illustrated by recent events at the 2010 Olympics. Of course, the Olympics are an entirely guardian affair, with origins in the military and the emphasis on amateurism which parallels the guardian aversion to commerce, so here's a couple of examples of thing done right, respecting guardian ethics and things done wrong, in contravention of Guardian ethics. "it's [the new snowboard] not for sale, either. 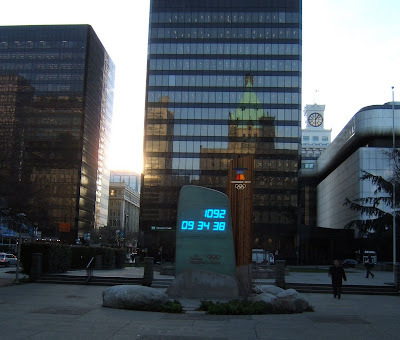 The deal Apex president Gerry Kavanaugh cut with Own The Podium, the program started to help Canada become the No. 1 medal-winning nation at the 2010 Games, gives them the exclusive rights. Besides, you get the impression Kavanaugh and Apex manager Matt Clarke, who are donating hundreds of hours to the project, would not divulge anything to a competing nation, even under threat of torture." A great example of being exclusive and shunning trading - and why those are good things under the Guardian syndrome. "Money certainly isn't the motivation. The project will cost Apex about $75,000 more than they're receiving from Own The Podium. Kavanaugh, 29, and Clarke, 22, are totally dedicated to helping the athletes. Clarke wakes up at 6 a.m. when the team races in Europe so he can get results on the Internet. "It's pride really," Clarke said." An example of how in guardian work, sacrifice is called for - not material gain and self-interest, as the purpose is not the promotion of comfort and convenience, but rather victory over the enemy. OK, second example. One of the ethics that is a bit surprising in the Guardian syndrome is 'be ostentatious' - the first reaction is that being ostentatious is not necessarily a good thing. But consider the Canada pavilion. Hume is the architecture critic for the Star, but I haven't encountered a soul, no matter how penny-pinching, who doesn't feel more should have been done to present a Canadian Olympic pavilion that doesn't look like a makeshift warehouse. In other words, the government failed in its duty towards ostentation. I imagine that if the folks at VANOC did any 'worst case scenario' planning, it must have looked pretty similar to the first day of the Olympics, steady rain, continued uncooperative weather postponing the alpine events, a cauldron malfunction, and of course, overshadowing all else, the death of Georgian luger Nodar Kumaritashvili in a training accident. Still, watching the performances by Ammann, Malysz and Schlierenzauer in the ski jump as they soared down the hill in Whistler this morning was a good reminder of the pure athleticism that lies at the central core of all the hoopla that is the Olympics. 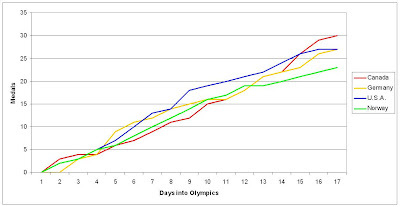 One: Explaining the methodology I used to construct a consistent historical comparison of national performance in the Winter Olympics over time. Yesterday, I was reading this post over at Chris' place about medical advances allowing us to regrow limbs. And today I ended up reading this editorial at the National Post* about the global conspiracy of scientists. When we think about civilizations advancing or declining, we tend to imagine that all aspects of the civilization are moving in the same direction at the same time. But what I'm seeing is that, in our case, our technological capabilities are still racing ahead** but our social institutions for directing that technology are in decay. This is of course not a new combination (think Germany in the 20's and 30's for an obvious example) but it certainly doesn't seem like a good combination either. ** except for anything that requires a lot of energy - the provision of which being something we can't seem to figure out despite decades of trying. No flying cars any time soon. "That would be quite a change, don’t you think? A commitment to Zero Budget Growth could become a powerful symbol of fiscal conservatism, just like the 'No Deficit' consensus was, to some extent, until the advent of Conservative government the global economic crisis." Wow, this promise would be just as credible as the promises of fiscal 'conservatism' that we get from the party that trashes the finances of any jurisdiction unlucky enough to elect it and spent it's days in opposition bemoaning the overly large (in their opinion) surplusses run up by the Liberals - I'm convinced! Anyway, go for it Mr. Bernier. Cut spending on the military (in real dollars), refuse to pay creditors any increased amount of interest owing on the debt, cut transfers for health and education funding, cut the old age supplement, cut child care benefits, cut spending on First Nations, cut spending on infrastructure. It all sounds very courageous. Note: This post is the thirty-ninth in a series. Click here for the full listing of the series. The next few posts in the series are going to focus on the Guardian Syndrome, as outlined in Jane Jacobs' 'Systems of Survival'. The Guardian syndrome is based on taking (as opposed to trading) as a way of life, and is used in organizations that are territorial in nature (governments, militaries, religions). 1) While maximization is a logical goal of the trading based commercial syndrome, maximizing taking (whether from nature or from other people) is not a sustainable approach. 2) While the commercial syndrome treats everyone equally as people/orgnaizations who have something to trade, the guardian syndrome makes a distinction between us and them (be exclusive, deceive (them) for the sake of the task) and also between superior and subordinate (respect hierarchy, be obedient, dispense largesse). 3) While the commercial syndrome never calls for somebody to make themselves worse off (only to refrain from bettering their condition at somebody else's expense) the guardian syndrome (treasure honour, be loyal, show fortitude, etc.) is all about sacrifice in the name of duty or some greater good. Walt Kowalski (played by Eastwood) is a military veteran (the archetypal guardian career) who is now retired and still living in and carefully maintaining his old house in Detroit (complete with American flag out front), even though the neighbourhood has been abandoned by almost all white people and has become a slum. The plot follows three main threads. The first main thread follows Walt adjusting the boundaries of his us vs. them group. At the start of the movie it is Walt against the world, defending the territory of his small patch of lawn in the slums of Detroit against all comers. By the end, he has overcome his racism to include the local Hmong community as part of his 'us' group that he is loyal to, choosing them over his own family who he sees as materialistic, shallow, commercial, self-interested and lacking in respect, discipline and honour. As Walt enters the Hmong community we even see the Hmong helping Walt make rich use of his retired leisure instead of just sitting on his porch all day. Walt's final act of largesse is to will his beloved Gran Turino to his neighbour Thao instead of to his family members who were coveting it. The second thread is the escalating cycle of violence and vengeance with Walt and his Hmong neighbours on one side and local gangs, in particular the local Hmong gang, on the other. The movie ends with Walt making the ultimate sacrifice, restoring his own honour, employing deceit for the sake of task, exerting prowess, showing his loyalty, and taking vengeance all in one final action. The third thread is Walt taking on a guardian type role with respect to his adolescent neighbour Thao, doing his best to help Thao 'become a man' while maintaining a hierarchical (paternal) relationship in which Thao is expected to obey what Walt tells him, and Walt feels justified in deceiving Thao as necessary to protect him. Looking at it again, every scene in the movie seems to reinforce the guardian characteristics of Walt's character. The movie opens with the funeral for his wife. At the funeral, we get a sense of Walt's character as he stands erect in formal suit and snorts in disgust at the lack of respect (for tradition, for their elders, for the church) shown by his grandchildren at the funeral. Where a commercially minded person might embrace the 'openness to novelty' of wearing a midriff and bellybutton ring exposing shirt to your grandmother's funeral, obviously Walt isn't buying it. Next we see Walt's disdain for the self-interested materialism of his granddaughter who tries to convince him he should give her his car (the Gran Turino). Next we see Walt's exclusiveness, as opposed to his willingness to collaborate with strangers, as he is extremely rude to the teenage boy next door (who is of Hmong descent) referring to him as 'zipperhead'. Then he corrects the local priest who calls him Walt, saying his name is Mr. Kowalski, again demanding the respect for tradition, and hierarchy. That's just the first few minutes, I could go on like this describing every scene, but hopefully you get the point - point being that Clint Eastwood's character in this movie is one of the purer depictions of the Guardian syndrome you're likely to see - both the good side and the bad side. I remember while on vacation in Nepal, at various points around the country you would encounter (often makeshift) roadblocks, at which a toll would be demanded, sometimes by the government, sometimes not. I was reminded of those tolls by this story in the Globe and Mail about the Government considering a purchase of the privately owned Ambassador Bridge (one of the busiest border crossings in the world). In Nepal, the tolls were demanded basically at gunpoint, although the guns were usually implicit (often only a 'voluntary donation' was asked for), albeit not quite as implicit as they are here at home. I remember during the 2008 Olympics, Canada had no medals after the first week and there were great cries of anguish across the nation. 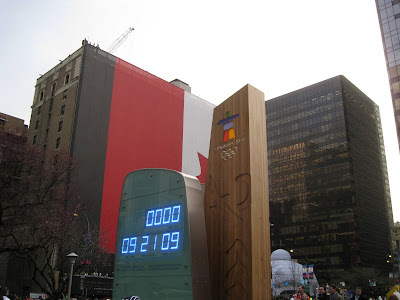 A few voices of reason tried pointing out that the vast majority of events where Canada had a shot at medals were scheduled for the 2nd week of Olympics but they were generally drowned out by cries wondering where we had gone so wrong and what had caused such a disaster. Of course, as it turned out, Canada ended up with 18 medals and one of it's better showings at the Summer Olympics. As you can see (following the red line on the chart - click on the chart to enlarge it), based on AP's predictions, Jackson has a point. Both men's and women's hockey and curling, as well as the short and long track relays all happen towards the end of the Olympics and these are all decent chances for a medal for Canada. Note: This post is the thirty-eighth in a series. Click here for the full listing of the series. This post looks in more detail at the commercial syndrome, trying to apply some of what we have covered in the previous 37 posts in the series. My thoughts on this are still pretty jumbled and that's likely to be reflected in this post, but nevertheless, here goes. The commercial syndrome describes the economy of trade or exchange, and the first group are the ethics that serve to ensure that any trades that take place are beneficial to both sides (i.e. win-win / pareto-efficient). Where these first 4 ethics are respected, people will develop trust that will allow them to greatly increase the number of transactions they participate in, by reducing transaction costs. Think back to the ridiculous transaction cost of the trade between Mal and Patience that I described here. Note that these ethics require the setting aside of short term self-interest, although it remains an area of controversy whether the short term self-interest is set aside in return for a greater long run self-interest (i.e. enlightened self-interest), or if it is set aside out of concern for the other party to the trade or for the benefit of society. We can think of the first block as representing the 'moral conditions of economic efficiency' to use Schultz's phrase. Without these moral values, trade will fail to achieve efficient outcomes. Although they may not be necessary in a perfectly competitive market, in almost any at-all realistic conception of a market, they are necessary. For example, if all trades could be conducted without placing goods at risk of theft or seizure, then there would be no need for an ethical value abjuring the use of force. But it is difficult to exchange goods without placing them within reach of seizure by the person you are trading with or other thieves. Thrift privileges savings over consumption and provides the means for productive investment. Initiative and enterprise as well as Inventiveness and novelty create opportunities for productive investment. Productive investment is only productive if it generates sufficient opportunities for profitable exchange. Efficiency and Industriousness serve the maximization of opportunities of exchange for a given investment. Collaboration with strangers and aliens allows for the greatest possible range of trading partners. Dissent for the sake of the task privileges maximization of trade opportunities over obedience. Optimism encourages people to take the risk of innovation and investment. etc. It seems reasonable that these two blocks of ethics should be linked in a syndrome since if the trades follow the first block of ethics so that they are beneficial on net, why wouldn't you want to make as many as possible? But this is exactly the question which an economist might raise: why would you need ethics in order to maximize trade? – why wouldn't people *want* to make as many beneficial win-win trades as possible? Aren't people just self-interested maximizers out to make as big a pile of money as possible? Taking Gauthier's view of ethics as an impartial restraint on behaviour, to the extent that 'natural' human behaviour corresponds with the behaviour needed to maximize trade, then no ethics would be necessary. However, as we'll see as we go through the list of ethics in this group, there are a few disconnects between human nature and 'homo economicus'. If we think back to Weber's example showing how capitalist enterprise might disrupt a stable market, we see that the drive to compete and to innovate and to use initiative and enterprise generally comes from putting self-interest ahead of the group interest, and therefore runs contrary to much ethical teaching. When a company cuts its prices, or improves its products, or invents new ones these actions are not beneficial to everyone, they have a harmful effect on the other companies in their industry. In fact, cutting prices can be harmful to the company itself when its competitors follow suit, and a cozy profitable cartel degenerates into a cut-throat competitive market. In the more extreme case, new inventions often cause old industries to disappear entirely in the process known as 'Creative Destruction'. Moving on, if you think back to the article by Steven Pinker that I linked to, he listed 5 areas where researchers had identified fundamental human areas of morality. One of these was community, so you can see how an ethic of 'Collaboration with strangers and aliens' might be required to overcome this element of human nature. Another area mentioned by Pinker was authority. So 'Dissent for the sake of the task' is required as an ethic to overcome the natural respect for authority we have. Note that something that both 'Collaboration with strangers' and 'Dissent for the sake of the task' have in common with 'Compete' and 'Innovate' and 'Show Initiative' is that they all tend to undermine any attempt at monopoly or monopoly-like behaviour by a group of people (i.e. cooperation/collusion). This is most obvious in the case of compete, but note how if a community was attempting to successfully boycott another community or group, this would require near or total unanimity. If all the movie theaters refuse to allow black people to buy a ticket then they all remain even. But this mass refusal creates a possible profit for any theater willing to break the ban. An ethic of 'collaborating easily with strangers and aliens' will serve to undermine any attempt at monopoly or restraint of trade along these lines. Similarly, the creation of new financial institutions not regulated as banks allowed people to get around the monopolistic behaviour of the banks who had historically presented a united front in refusing to lend large sums of money to subprime borrowers for the purpose of buying houses, even though any one of them could have made large profits (in the short term at least) by making such loans. The need for an ethic to support 'Industriousness' seems obvious enough. People are 'lazy' (i.e. less industrious than is optimal for the production of as many trade-able goods as possible) by nature, so any ethic that makes people work longer or harder would support increased trade. Along with 'Industriousness', 'Efficiency' must counter natural laziness, and they both are only positive ethics in an environment in which no limit on growth is needed or in one where some other force is imposing a limit on growth. What I mean is that, when it comes to an activity which is primarily about taking (as opposed to trading) - think fishing or logging - a combination of industriousness and efficiency will leave you with barren hillsides and lifeless seas. For most of human existence, we got much of our sustenance by taking from nature, so industriousness and efficiency were potentially dangerous values. But for areas of trade where limits on growth are not needed in the same way (e.g. computer hardware development) industriousness and efficiency can be a formidable force. 'Thrift' and 'Investing for productive purposes' both must counter the natural bias towards short term thinking that people have. Thrift means postponing consumption, as does investing for productive purposes. What is the ratio of people who struggle with procrastination vs. people who struggle because they are always getting hard things over with quickly? This ties in with the concept of hyperbolic discounting, discussed earlier. Optimism runs counter to what seems a natural human tendency toward fatalism and risk aversion. Many aspects of human life (particularly in earlier days) are non-linear in the sense that getting twice your daily intake of food is merely a nice bonus whereas getting half your daily intake of food means death. This leads to a sensible tendency towards risk aversion in many situations. However, risk aversion works against the spirit of innovation and risk taking that is central to capitalist development, so optimism and openness to inventiveness and novelty are needed as ethical values to help overcome this. Note that while competition is a spur to the second block of ethics (if you don't innovate, the competition will, if you won't sell to Myanmar, your competition will), it has a more mixed relationship with the first block of ethics. Competition helps to ensure that trades are truly voluntary in the sense that if a company is behaving dishonestly or not respecting contracts, you can punish them by moving to their competitor, whereas, if the company has a monopoly, your options are limited. But, on the other hand, companies can be driven to dishonest behaviour, to not respecting contracts, to the use of force (against unions, for example) by competitive pressures. Another way of looking at the first block of ethics is to see it as a set of restrictions on the domain of competition. In a simple exchange, self-interest, group interest and social interest are in alignment (if the first group of ethics is adhered to), but in a capitalist market, there is a conflict between self-interest and group interest and the second group of ethics is the ethics for promoting the interest of the self at the expense of the group. The project of Adam Smith and many that came after was to demonstrate that despite this conflict with the group interest, there is nonetheless a benefit to the social interest that justifies this 'selfish' behaviour. And that although cooperation is helpful in most areas of human endeavour, cooperation (collusion) between market competitors carries a social cost. I think this distinction is why the force of the first group of ethics is much stronger than the force of the second group. The moral condemnation of a country that invades another to seize it's oilfields is stronger than the moral condemnation of a group of oil producing countries that work together (i.e. collude) to keep the price of oil high. notice how ethically complex the commercial syndrome is at the same time. On the one hand, you have a block of (economic) efficiency ethics whose purpose is to prevent you from pursuing your short term self interest in ways that are harmful to society (force and fraud). On the other hand, you have a block of ethics whose purpose is to encourage you to pursue your short term self-interest, in ways that may be harmful to yourself (in the longer term) and are certainly harmful to your competitors, but which yield a net benefit to society. The common element, as stated by David Hume, is what is useful (beneficial) to society as a whole. Finally, we have 'Promote comfort and convenience.' Reading about 'industriousness' and 'thrift' and 'innovation' and 'efficiency', you might start to wonder, what is the point of all this. Why accumulate money if you never plan to put it to any good use other than making more money? As modest as it sounds, 'Promoting comfort and convenience' is the goal of the commercial syndrome. Weber alluded to this in recognizing that a modest, yet comfortable home was one of the things that even the ascetic Protestant groups he described recognized as being a reward for keeping the capitalist faith of thrift and so on. Any fantasy novel reader will recognize that while a medieval castle in invariably grand but damp and drafty, the home of a merchant is almost invariably less opulent but comfortable and cozy (excluding evil merchants, of course). The question is why? I think the answer lies in the distinction between positional goods and non-positional goods. As discussed earlier, the pursuit of positional goods is a zero sum game since any gain is offset by a negative externality to those who did not gain. The whole goal of the commercial syndrome is to play a non zero-sum game. But it only works when the profits generated by the system are used to support non-positional (non status related) human goals. It does us no good to generate massive wealth if we spend that wealth building houses larger than our neighbour's, that we then leave half empty because we don't need all that space. It does us no good if we spend half our lives trying to get an academic degree with more letters than the next guy so we can beat them out for a job we only needed a year or two of post secondary education to do competently. But if instead that money goes towards central heating, to improved medical care, to cars that have airbags, to high speed rail lines and so on, then we are making progress with our wealth in making life more comfortable and convenient for ourselves. One thing worth keeping in mind is that the list of commercial ethics was constructed to contain only those elements that differ from the guardian syndrome, so to some extent what we see here is an echo of the ethical requirements of guardian work. i.e. If industriousness was also helpful in guardian work, then it wouldn't be on the list, so the presence of industriousness reflects as much the lack of need for industriousness in guardian work as it does the need for it in commercial work. This means that in order to better understand the commercial syndrome, we will need to go into more detail on the guardian syndrome (and vice-versa) and then we will need to consider the two syndromes together as an interlinked system. To truly understand the syndromes will require a fully functioning dynamic model of both syndromes and their interaction to show how they can develop and be stable (or not) over time. Some of this work is already underway, and I plan to cover some of it in future posts, but for the next few posts, I'll likely shift focus a little bit from what has mainly been static analysis of the commercial syndrome to a static analysis of the guardian syndrome. One step at a time.